Warburton is a town in Victoria, Australia, 72 kilometres east of Melbourne's central business district. Your day-by-day itinerary now includes Healesville Sanctuary, William Ricketts Sanctuary and Puffing Billy Railway. On the 14th (Sun), contemplate the long history of William Ricketts Sanctuary and then get interesting insight from Puffing Billy Railway. To see maps, ratings, photos, and tourist information, read Warburton trip itinerary maker tool . Perth to Warburton is an approximately 8.5-hour flight. You can also drive. The time zone difference moving from Australian Western Standard Time to Australian Eastern Standard Time (Victoria) is 2 hours. In April, Warburton is slightly colder than Perth - with highs of 24°C and lows of 8°C. On the 15th (Mon), wrap the sightseeing up by early afternoon so you can travel to Gisborne. Gisborne is a town approximately 55km north-west of Melbourne, Victoria, Australia. Your day-by-day itinerary now includes Bendigo Art Gallery. Kick off your visit on the 15th (Mon): admire the masterpieces at Bendigo Art Gallery and then examine the collection at The Stokes Museum. Here are some ideas for day two: explore the activities along Walter J Smith Reserve, tee off at Mandalay Golf Course, and then take in the architecture and atmosphere at Our Lady Ta' Pinu Shrine. For where to stay, traveler tips, reviews, and tourist information, go to the Gisborne road trip planning website . Drive from Warburton to Gisborne in 2 hours. In April, daytime highs in Gisborne are 23°C, while nighttime lows are 11°C. Cap off your sightseeing on the 17th (Wed) early enough to travel to Melbourne. 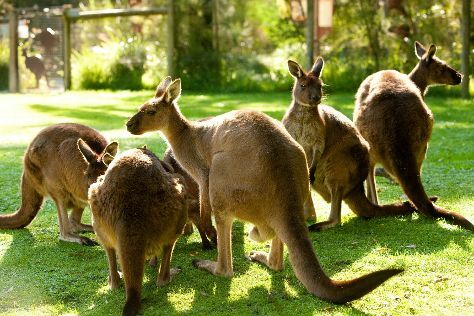 Your day-by-day itinerary now includes Phillip Island Wildlife Park. Explore hidden gems such as Cape Schanck Lighthouse and Cape Schanck Boardwalk. Get outdoors at Fishing Charters & Tours and Panorama Garden Estate. Explore the numerous day-trip ideas around Melbourne: Point Lonsdale Lighthouse (in Point Lonsdale), McClelland Gallery & Sculpture Park (in Langwarrin) and Fort Queenscliff Museum (in Queenscliff). Next up on the itinerary: enjoy the sand and surf at Rye Beach, explore the world behind art at The Johnston Collection, get outside with Geelong Adventure Specialists, and learn about all things military at RAAF Museum. For other places to visit, photos, more things to do, and tourist information, you can read our Melbourne day trip site . Drive from Gisborne to Melbourne in an hour. April in Melbourne sees daily highs of 23°C and lows of 11°C at night. Finish your sightseeing early on the 23rd (Tue) to allow enough time to travel back home.